I find it very hard to write reviews about books that are sequels to series just because I cannot expect that everyone has read the first book(s) and thus I do not want to spoil anything for ones who might have to read the first book at some point. But I will try my best with this one. So in Unbecoming of Mara Dyer, Mara and her family move from Rhode Island to Florida after Mara is the only survivor from an accident at an old asylum - Mara's best friend Rachel, her friend Claire and her boyfriend Jude died. When they reach Florida Mara starts to see things that she cannot explain. When she meets Noah, a super hot and rich guy with a British accent, she is afraid that her issues will make their relationship difficult. But then she learns that Noah also has a secret and that they might not be quite similar as the people around them. The book ends with suspense as Mara thinks she sees someone who is supposed to be death. 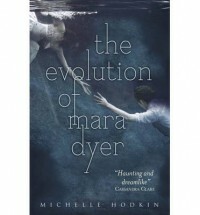 The Evolution of Mara Dyer opens up with Mara in a hospital. When she tells that she has seen Jude, the guy who is supposed to be death, no one believes her. Except Noah. The perfect, handsome, charming Noah. Mara knows that if she cannot pretend to be somewhat normal, her family will ship her to mental institution. Thus she decides to keep her issues to herself and she is enrolled to an outpatient program at a mental institution - this means she can still live at home and spend time with Noah, the only one who actually believes her. But as the attacks from Jude get more and more intense, it gets difficult for Mara to pretend that everything is okay. And the relationship with Noah is not only sunshines and puppies either because of the fact that Mara is afraid that if they get too intense, she might hurt Noah. And Noah is the last person she would ever want to hurt. I feel like it took me a while to get through maybe the first 60% of the novel. This was mostly due to the fact that I did not really remember perfectly all the events from the first book and kind of had to go back to check on some things. But wow, the last 40% were so exciting and action packed and full of surprises. The ending took me completely by surprise - I would never have expected that kind of plot twist. It feels impossible that I have to wait til March 2014 for the next book. Like in the first novel, Mara is likable, but a lot darker than in the first book. More and more issues are piling on her and once again you really do not know at points can you trust her or not. Noah, of course, is perfect, so I won't say much about him. I know for some the relationship between these two might be kind of cliche - he is ready to pay for her protection etc. and I must admit I somewhat got Edward Cullen vibes from him at points (I think it is just the rich, sulking, protectiveness). But unlike Bella, Mara is strong and independent, and thus their relationship is not that one-sided. I really loved the fact that in this book we got more information about Mara's family, especially her mother and grandmother, who's point of view is offered in this novel. The connection between Mara and her grandmother is not fully explained yet, and it is something I am definitely looking forward from the next book. I also have a soft spot for Daniel, Mara's big brother, and hope that there will be more about him on the next book. When I wrote the review for the first book I criticized the some what paranormal element of the first book (meaning the powers) and hoped that it would be explained in the second book. AND IT WAS. And wow.... this is the plot twist I am talking about. I cannot wait to see who Hodkin extents this whole issue. I really enjoyed The Evolution of Mara Dyer and really cannot wait to see how the story processes.